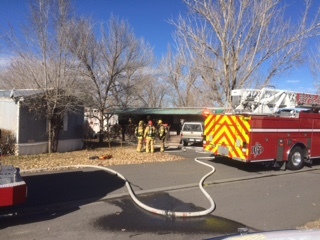 The Grand Junction Fire Department (GJFD) responded to a report of a structure fire in the Paradise Valley Mobile Home Park on 25 1/2 road. First unit on scene (Truck 3) arrived within 3 minutes of the dispatch time and reports heavy smoke coming from the front side of the trailer. Truck 3 immediately pulled fire lines and used a transitional attack method to fight the fire. This method of fire fighting allows the crews to cool the fire by knocking it down from an outside window before going in and completely extinguishing the flames. GJFD Engine 5 crew entered the structure from the rear and assisted in the extinguishment of the blaze. One civilian was transported to a local hospital for smoke inhalation. Fire investigators were dispatched to the scene to assist in determining the cause of the fire. The circumstances of the civilian’s injury is not yet known and the cause of the fire is still under investigation. All fire investigation questions will be directed to the Grand Junction Fire Marshal’s Office at (970) 549-5800. No other civilians were injured and no other structures were involved on this incident. Previous postGas Leak: 840 N. 11th St.